We wish all our readers the best for 2009 in real life and virtual worlds despite the economic downturn which has spread around the globe. May all of you have a safe and happy Christmas and may the prospects for our world, whichever world that is, brighten in the New Year. The SLENZ Update will not appear between Christmas and New Year, even though all worlds will continue turning. The next issue will be about January 5, 2009, although we may blog anything special which happens in between the holidays. In the meantime for you who are still reading blogs on Christmas eve here are two items to think about over the holiday break. By the way I think I want a Playstation 3 from Santa!!!! No Virginia, Santa cannot teleport with Rudolph, his sleigh and his assets between Virtual Worlds. Yet. But as Peter Quirk (Senior Consulting Program Manager at EMC, Boston) says its “the early days” for Virtual World interoperability. Commenting via LinkedIn he noted that most of the worlds (hundreds at present – see http://www.kzero.co.uk/blog/?page_id=2537 ) have been “designed as walled gardens”. Commenting that interoperability comes in many forms – asset compatibility or interchange, common authentication systems, avatar compatibility and re-use, real-time messaging and voice interoperability, common currency, trade between worlds, etc – he said that in terms of asset compatibility, it’s becoming clear that commercial tools like 3D Studio Max, Sketchup and Maya and free tools like Blender can produce assets in multiple formats that can target multiple worlds. The Collada format and the KML wrapper supported by Sketchup and Google Earth is gaining traction as an import format for a number of platforms. Asset libraries are also developing quickly. Google’s 3D warehouse provides assets in Sketchup or Collada format, but tools exist to convert them to other formats (see my post http://tinyurl.com/6qfn2a for an example) Dassault Systemes has leveraged its investment in professional parts libraries to build a library of 3DVia parts for Microsoft’s Virtual Earth and 3Dswym. I’m sure more will follow. Turbosquid is a clearinghouse for digital artists to sell 3D models and textures. The assets are delivered in the formats used by high-end design tools, with which they may be repurposed for Virtual Worlds. “Unfortunately, that’s only half the story – scripts are what make assets interesting and the interoperability of scripts is minimal,” he said. “There is some compatibility of Linden Scripting Language between Second Life, OpenSim and realXtend but there are enough differences to make it difficult to predict whether a script will be usable on any platform. OpenSim has its own script extensions (OSSL) and realXtend achieves a lot of its scripting power from server-side Python scripts which can make up for missing functionality in the OpenSim LSL implementation. However, Quirk said, common authentication in Second Life, OpenSim and realXtend is getting close. This year’s experimental teleport activity between Second Life and IBM’s OpenSim was based on major work to develop open grid protocols for authentication, grid discovery and asset management. (See http://wiki.secondlife.com/wiki/Open_Grid_Public_Beta/Open_Sim_OGP_How_To ). But, Quirk went on, Avatar compatibility is likely to be more complex due to the fundamentally different ways of representing meshes and skeletons, not to mention the IP issues of taking clothes and accessories between worlds. “Real-time messaging and voice between worlds shouldn’t be hard but there hasn’t been a lot of focus on this, presumably because one needs to be able to discover the identity of someone in another world before calling them,” he said. Quirk said he believe a common currency is a some way off. OpensSm is starting to implement support for “play money” as some call it, but a serious bank or Linden Lab will have to provide the back-end services to enable conversions from real currency to in-world currency and for currency exchanges between worlds. On this point he commented that many national and state governments are interested in taxing sales and capital gains in-world, further complicating the roll-out of cross-world trading. In many of the teen worlds the money enters the world via gift cards sold in stores. The sales tax is paid in the store. There is no indication that these walled gardens want to open up to other currencies yet. He didn’t mention it but Sony,which announced last month that 17 million PS3s have been sold worldwide leading to one estimate of the PSNetwork having 8.5 million users, would appear to have a headstart over almost all PC-based Virtual Worlds. The major exception is Habbo Hotel which has 100 million registered avatars, an average 8 million unique visitors monthly,with 75,000 avatars being created every day. Eat your heart out SL? Workshop: Building designer, Aaron Griffiths, joint project leader (RL) Terry Neal, and lead educator Merle Lemon work on the details. The SLENZ workshop held in Wellington, New Zealand, mid-December achieved the goal set for it – the initial establishment of the learning activities needed to achieve the SLENZ Project objectives. The three-day event at WelTec ended with all participants agreeing on “a fairly complete overview of what will be done” to create the two New Zealand pilot education programmes in foundation learning and midwifery in Second Life. All nine participants in the two-day, “closed” part of the workshop, however, also would probably agree that the process of determining the activities, resources and support needed to achieve Stage 1 of the pilots, rough out Stage 2 and develop the Stage 3 vision, needed considerable refinement. Earlier in their “Process for learning design for the SLENZ project” joint project leader (Real Life) Terry Neal and learning designer Leigh Blackall said that because all involved in the SLENZ project were learning through the project, it was important that “our process for designing learning activities is flexible and engages as many of the participants as possible. Blood, sweat and no tears … some of the participants in the open session of the workshop. The facilitators – as were all participants – were heavily involved and all would have left the workshop with both a sense of achievement and ownership of the projects. And it appears likely that at least one academic publication, which could become a key text in guiding the creation of viable education initiatives in multi-user virtual worlds, will result from the workshop. The workshop began with a valuable, if at times technically fraught, scene-setting, one-day, open workshop attended by more than 40 people in RL and some 20 in Second Life at the Nelson Marlborough Institute of Technology island of Koru (http://slurl.com/secondlife/Koru/156/122/27). The Real Life participants were mainly drawn of New Zealand universities and polytechnics. The Second Life participants included SL education developer Jo Kay, of Wollongong, Australia, and in Second Life Jokaydia, who detailed her Australian activities and University of Arizona, US, students who spoke candidly about their reactions to learning in Second Life as well as answering questions in realtime from the live audience(unedited text script at http://docs.google.com/View?docid=ddbqbfvm_118qn5pmx3). The morning session included an, at times, fairly volatile discussion of critical perspectives for education within virtual worlds with some participants opposed to the use of virtual worlds for education. The session was completed with “brainstorming” sessions on the two proposed pilot programmes – Manukau Polytech’s foundation education project led by Merle Lemon and Otago Polytech’s midwifery education, led by Sarah Stewart – which led to some valuable new insights into the projects. There is no doubt that the SLENZ team benefited from the brainstorming activities which also served to raise awareness of the potential for Second Life to improve adult learning experiences. The documents produced in these sessions were used by the project team in establishing goals and determining how best to go about the creation of the pilots. During the course of the workshop it was determined that there were actually three pilots – the two education projects and an orientation/education pilot for facilitators and students. Probably the two key problems which the workshop faced were the differing philosophical leanings and sometimes boundless enthusiasm for other new media which led to some frustrations in the debates, and the lack of Second Life/MUVE experience of some of the key education participants. This led to some difficulty at times in keeping the workshop focused on relevant Second Life issues and in determining what activities should be left in Real Life, in-on-line learning, print media or machinima. 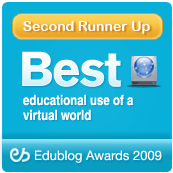 There were also problems in narrowing down exactly what the educators wanted to achieve through Second Life, possibly because of a lack of experience in virtual worlds. Finally, although the free-flowing nature of the workshop brought up a considerable number of new and valuable ideas the decision-making process might have been improved with a tighter focus on the targets and what needed to be achieved. The workshop was the first major function to be held by SLENZ since it secured funding from the New Zealand Tertiary Education Commission to determine the benefits of virtual world education in New Zealand, particularly for adult learners. The SLENZ team has published its Literature Review, Engaging with Second Life: Real Education in a Virtual World. The review, designed to inform in a practical sense the activities of the SLENZ project, brings together research findings, anecodotal reports of practice, and the opinion of those experienced in the use of Second Life (SL) for education from across the globe. Written by Ben Salt, Clare Atkins and Leigh Blackall it draws together a number of strands: an overview of the characteristics of the current generation of MUVEs, a snapshot of educational activities currently in Second Life, a discussion of the major learning theories that may be relevant to the project, consideration of the design of learning activities and an exploration of what techniques could be used to control the development of the building of the relevant online resources. It is published under Creative Commons license. Self-proclaimed market and technology leader in enterprise virtual world, Forterra Systems, is using the economic downturn and collaboration with IBM, to spruik its virtual worlds’ experience as being “better” and less costly than conference calling, the mainstay of world business. Offering innovative collaboration features and IBM Lotus Sametime Integration with its OLIVETM(On-Line Interactive Virtual Environment) 2.2 Release, Forterra Systems plans to ship the new software later this month. The video demonstration of the new software shows it will be of interest to educators around the world given some of the vagaries of other virtual world systems. Forterra Systems says the new features have been prompted by feedback from several customers in global organisations and analysts who have noted that virtual meetings in OLIVE are both more engaging and less expensive then traditional Web and audio conference calls. “With the challenging financial times most enterprises are curtailing travel and rethinking how their organisations hold events, training sessions, conduct periodic meetings, or improve their collaboration processes. “Audio and Web conferencing are inexpensive, ubiquitous, and generally easy to use,” the release says. ” However for meetings involving complex or longer topics the participants can be challenged to grasp the discussion context and maintain focus due to multi-tasking. Virtual meetings in OLIVE are proving to be less expensive yet more engaging and productive for users. Most enterprise-grade teleconferencing systems charge $0.10 to $0.25 per person per minute which can equate to thousands of dollars of expense per employee every year. OLIVE pricing is an order of magnitude less. A team of University of Florida computer engineers and scholars has used the popular online world Second Life to create a virtual Chinese city for users who want to familiarise themselves with the sights and experiences they will encounter as first-time visitors. The goal of the federally funded research project is to educate and prepare foreign service or other government professionals to arrive in the country prepared and ready to work, .ScienceDaily reported. One wonders how long the US’s three-letter agencies have been doing the same thing in Second Life. The authors said the trainees quickly learnt to use Internet voice communication and user interface to navigate their online character/avatar to work effectively in a critical care team. “Our findings demonstrate that these virtual ED environments fulfill their promise of providing repeated practice opportunities in dispersed locations with uncommon, life-threatening trauma cases in a safe, reproducible, flexible setting,” they said. Earlier in their abstract of their paper they had noted that individuals in clinical training programs concerned with critical medical care must learn to manage clinical cases effectively as a member of a team. In the paper they present three virtual world studies for team training and assessment in acute-care medicine: (1) training emergency department (ED) teams to manage individual trauma cases; (2) prehospital and in-hospital disaster preparedness training; (3) training ED and hospital staff to manage mass casualties after chemical, biological, radiological, nuclear, or explosive incidents. For the project the research team created realistic virtual victims of trauma (6 cases), nerve toxin exposure (10 cases), and blast trauma (10 cases); the latter two groups were supported by rules-based, pathophysiologic models of asphyxia and hypovolemia. December 12, SLtime, 10 am-4:30pm: The Louisiana Invitational Conference, Virtual Worlds in Higher Education presented by the University of New Orleans, Southeastern Louisiana University, Southern University in New Orleans and Tulane University, at The Louisiana Regents Estate in Second Life. Keynote speaker: Jeremy Kemp, instructional designer at San Jose University’s School of Library & Information Science. Other speakers: Thomas Kohler, of the University of Innsbruck, Joshua Squires, of the University of Georgia, Daniel Livingstone, of the University of West Scotland, and Gwenette Sinclair, of Kennesaw State University. No entrance fee. If you would like to attend the conference, visit http://virtualcampus.uno.edu/ and click “Register.” You will need to provide your name, avatar name, and e-mail. I’m always looking for some way to explain Second Life and my feelings about it to real world people. Well Philip Rosedale (SL: Philip Linden) founder of Second Life has done just that in one of his more accessible speeches for everyman and woman. He details just why he built the world, its underpinnings in human creativity, and where he thinks it is going. With questions the TED speech is 28 minutes but quite an inspirational 28 minutes and well worth sharing with both Second Life neophytes and people who might know nothing about outer space a la Linden Lab. The Immersive Education Initiative is an official activity of the international Media Grid standards group. (http://mediagrid.org/) The Media Grid standards group actively applies open standards to specific problem spaces, such as distance education, digital libraries, and the impact of digital media on culture and society. Immersive Education is not limited to one platform but considers the whole gamut and for that reason alone is well worth following. For instance late last month Immersive Education Japan (iED Japan) ran a series of Immersive Education Days at University of Aizu, Japan, as part of Immersive Education: ASIA, programme. Immersive Education presentations, lectures, workshops and related events included IEI members from Boston College, University of Aizu, National University of Singapore, Keio University, Smithsonian Institution, Montana State University, Southeast Kansas Education Service Center at Greenbush, University of Essex and Sun Microsystems to provide an in-depth overview of Immersive Education, the Education Grid [http://TheEducationGrid.org] and related technologies. To coincide with the event Japan’s first “node” (virtual world and collaboration server) on the Education Grid was announced. Hosted by the University of Aizu and sponsored by Sun Microsystems, Japan’s Education Grid node will enable cultural and technological exchange with educators and students around the world through virtual learning worlds and collaboration environments. Related announcements/initiatives included the launch of three new Project Wonderland (pictured – video is on IE site, along with videos from Second Life and Croquet) Community Groups; progress report by the Open File Formats Technology Group; formation of the Library Technology Working Group; formation of the Psychology of Immersive Environments Technology Working Group; formation of the Assessment, Evaluation and Grading Technology Working Group; preview of Second Life, realXtend, and OpenSim nodes on the Education Grid; and the official launch of the Initiative’s “Own the Node” program. Second Life: Better every day? Some Second Life residents might not agree with the Linden Lab claim that Second Life is becoming more usable and more reliable. Perhaps I’m tempting the Gods but I for one , however, believe the claim. Putting aside ISP problems my Second Life experience has improved considerably over the past three years – and I would average more than two hours a day in world often at peak US usage periods – but its still far from perfect. I make this observation in light of the Lindens’ recent claim (http://blog.secondlife.com/2008/12/02/m-linden-second-life-update-and-welcome-to-howard-linden-aka-howard-look/) that their staff has been hard at work over the last few months making Second Life more relevant, more usable and more reliable. Noting that reliability was a top strategic focus for the Lab, he said that the launch of LL Net (the private fiber optic ring connecting the Linden Lab data centers) to provide additional redundancy and eliminate reliance on VPNs, was ahead of schedule..
On the issue of making Second Life more relevant, he said, the Big Spaceship project to improve residents’ first hour experience was proceeding well alongside a new website design. Although the team also was making great progress on the major usability project, redesigning the viewer so that it was easy to use for new residents without sacrificing functionality for experienced users, he said, it would be well into the second half of next year before the new client was implemented. At the same time Linden Lab has been out hiring and as placed Howard Look (SL:Howard Linden) formerly a VP of Software at Pixar, into the role of SVP of Customer Applications ( “The Front”) He will be responsible for leading the engineering team responsible for the customer-facing part of the Second Life experience. Interestingly for educators Howard also has a passion for education and spent time this past summer as a substitute teacher (4th grade and middle school math). December 12, 10:00 a.m. – 11:30 a.m: (Public seminar) Open Educational Resources and Scholarship in the 21st Century, University of Auckland Conference Centre, 423-342, 22 Symonds Street, Auckland. Speaker: Joseph Hardin, the Director of the Collaborative Technologies Laboratory in the Media Union and Clinical Assistant Professor in the School of Information at the University of Michigan, Ann Arbor, and currently the Board Chair for the Sakai project. Prior to joining the University of Michigan, he was head of the Software Development Group (SDG) and Associate Director for Software Development at the National Center for Supercomputing Applications (NCSA) at the University of Illinois. Most notably, his teams were responsible for the development of the NCSA Mosaic browser, arguably the tool that launched the world wide web. Virtual Peace: Turning Swords to Ploughshares (http://virtualpeace.org), a humanitarian/disaster assistance training simulation brings together digital learning technologies and international humanitarian assistance efforts. It has been funded by the MacArthur Foundation and HASTAC. Created by Duke University’s Tim Lenoir (full project team: http://virtualpeace.org/people.php) in collaboration with Virtual Heroes, Duke-UNC Rotary Center, Duke’s Computer Science Department, and Duke Information Science and Information Studies (ISIS) it allows students and educators to enter an immersive, multi-sensory game-based environment that simulates real disaster relief and conflict resolution conditions in order to learn first-hand the necessary tools for sensitive and timely crisis response. Interestingly the simulation uses the avatars of real people and simulations of real places for what is a realistic training scenario based on reality. Learn more about Virtual Peace. 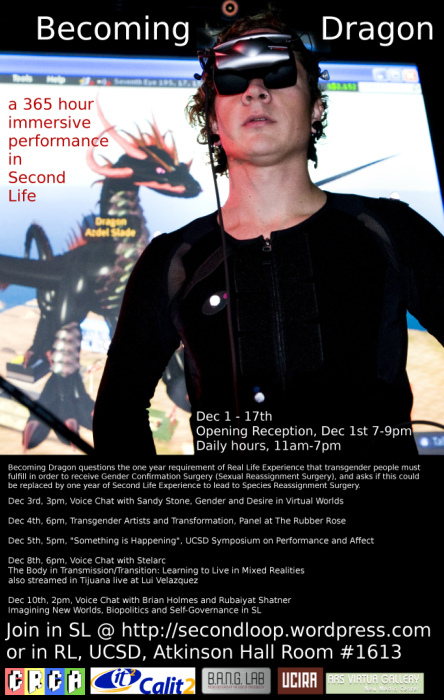 To fulfill the final project requirement for her MFA in visual arts, the student Micha Cardenas (SL:Azdel Slade) (pictured above) (http://secondloop.wordpress.com/), a transgender person, will spend 365 consecutive hours immersed in Second Life, wearing a head-mounted device with a stereoscopic display that blocks all but the virtual world from her view, in a to-scale virtual model of the actual performance space (complete with the black leather couch that will serve as he RL bed). She will spend the entire duration of the performance in a laboratory at UCSD’s Center for Research and Computing in the Arts (CRCA) at the California Institute for Telecommunications and Information Technology (Calit2). 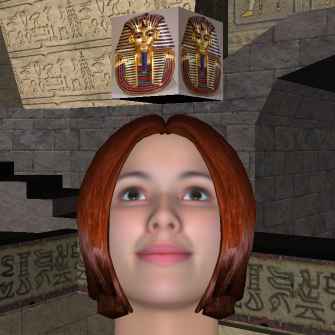 Cardenas’ movements are being mimed by way of a Vicon motion-capture system, which allows her avatar’s movements to correspond with her own in real-time. In essence, Cardenas will “become” the dragon, moving and even speaking as her avatar by way of a Pure Data patch called “Lila” that modulates her voice. The project is also a means of questioning the one-year requirement for “real-life experience” that transgender people must fulfill in order to receive gender confirmation surgery (also known as sexual reassignment surgery). “The general theme for my project is to explore the possibilities for transformation, to ask the question, ‘Is change really possible, or do you get what you’re given, and that’s it? '” Cardenas explained to Psyorg. “I’m asking if it’s possible to replace this real-life experience requirement with Second Life experience, but I’m also asking a question that is somewhat rhetorical or fantastical: Could you really become your second-life avatar? Looks like our lag performance, although in New Zealand mainly attributable to the lack of foresight or investment by either Telecom or TelstraClear, will not be improving in the near future. Of course the New Zealand Government could use private enterprises such as NetFx ( the fastest commercial internet service in the country) to end the provincial internet problems cause by the two main players. Given the right funding NetFx could easily implement its optical cable system in provincial towns throughout the country as is currently being done on a local government basis in places like Dannevirke. But on the plus side he said that the 2009 beta of a standalone Second Life grid which will allow users to run their own grid was progressing.